Azure Machine Learning Studio is an interactive programming tool for predictive analytics. It is a professional tool that lets users easily drag-and-drop objects on the interfaces to create models that can be pushed to the web as services to be utilized by tools like business intelligence systems. Azure Machine Learning Studio is a platform where data science, predictive analytics, cloud-based tools, and data collide and mixed to form an idea and deployed into an effective model. With Azure Machine Learning Studio, developers also gain access to APIs that they can infuse into their model for enhanced cognitive algorithms and transformative artificial intelligence. Azure Machine Learning Studio is not a run-of-the-mill platform. It makes developing models more fun and much easier with its drag-and-drop function that works on datasets and analysis modules. These movements are used to form experiments that are run in the program. Editing, saving a copy, running, converting, and publishing experiments is also a straightforward process. Because of its visual connections, no heavy programming is required and models are completed at a faster pace. 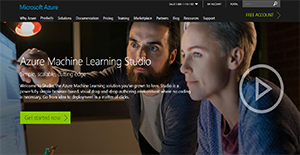 Azure Machine Learning Studio brings together developers from different places in the Cortana Intelligence Gallery. It is a section of the platform where users can share and discover solutions that can be of use to others and to themselves. The community is also where users can query their fellow programmers and where they can work together to arrive at an answer to a problem. Models designed within Azure Machine Learning Studio can be pushed straight to the web where it can be accessed by people who can find them beneficial to their own projects. This lets users send data to the model and receive predictions from it, which they can apply to their own processes. However, in case of changes, developers are still able to update published models and manage them through the platform’s web services portal. With Azure Machine Learning Studio, developers have a library of AI algorithms within their reach. They can use these cognitive APIs to enhance their predictive modelling to come up with more accurate results to transform the way they process business intelligence data. Azure Machine Learning Studio is accessible to anyone with an internet connection. There is no need to install programs on devices, which means it can be deployed and utilized on any desktop or laptop computer. This mobility enables users to bring their work with them wherever they go so they can finish projects at their convenience. If you are considering Azure Machine Learning Studio it might also be beneficial to investigate other subcategories of Best Artificial Intelligence Software listed in our base of B2B software reviews. There are trendy and widely used solutions in each software group. But are they necessarily the best fit for your organization’s unique requirements? A popular software solution may have thousands of users, but does it present what you require? For this reason, do not blindly spend on popular systems. Read at least a few Azure Machine Learning Studio reviews and mull over the elements that you desire in the software such as the cost, main functionality, available integrations etc. Then, choose a few solutions that fit your wants. Check out the free trials of these apps, read online comments, get information from the seller, and do your research systematically. This exhaustive groundwork is certain to help you find the best software platform for your company’s specific requirements. How Much Does Azure Machine Learning Studio Cost? Azure Machine Learning Studio offers the following enterprise pricing packages for users to choose from. Give the details a look, and select the best plan for your business. We realize that when you make a decision to buy Artificial Intelligence Software it’s important not only to see how experts evaluate it in their reviews, but also to find out if the real people and companies that buy it are actually satisfied with the product. That’s why we’ve created our behavior-based Customer Satisfaction Algorithm™ that gathers customer reviews, comments and Azure Machine Learning Studio reviews across a wide range of social media sites. The data is then presented in an easy to digest form showing how many people had positive and negative experience with Azure Machine Learning Studio. With that information at hand you should be equipped to make an informed buying decision that you won’t regret. What are Azure Machine Learning Studio pricing details? What integrations are available for Azure Machine Learning Studio? Azure Machine Learning Studio offers APIs for developers’ use. For more information, contact support or get in touch with the community. If you need more information about Azure Machine Learning Studio or you simply have a question let us know what you need and we’ll forward your request directly to the vendor.